When you’re a professional, you do things differently to the way amateurs in the Towing Services Industry do them. For a start, you listen to your clients, understand their priorities and make them yours. We know what our clients hate doing – waiting. Therefore, we locate our Tow Trucks in the suburbs in which we do business. If you’ve had an accident or a breakdown in Brighton-Le-Sands, we will send you a Tow Truck that’s located near you. This ensures you will never wait more than 31 minutes for road-side assistance. In fact, many accidents happen after a breakdown has occurred. The driver leaves their vehicle and tries to fix the fault themselves. Not realising what they are to oncoming traffic. A distraction. If you’ve had an accident on the Prices Highway, or a key arterial road in Sydney, the best thing you can do is leave your vehicle once you get it to the side of the road and get to higher ground. If you don’t follow this simple precaution, you could distract drivers. They could lose control over their wheel and crash their car into you. They know the road is not a safe place for anyone to be. So, they don’t waste time talking or haggling about price. Their priority is to get you and your vehicle out of what is often a dangerous zone in which accidents can happen. A good Tow Truck Driver who knows what he is doing will arrive with all the right equipment in place. Within minutes, they will winch your vehicle to theirs and move it to the garage or place that’s safe. If you’re really stranded, they may even offer you a ride in their truck’s cab. There are many different types of Tow Trucks that Professional Towing Companies use to rescue their clients. Flatbed trucks, for example, get your vehicle’s wheels entirely off the ground. Since the wheels don’t touch the road, the likelihood of your car being damaged is very much reduced. If you own a Prestige Vehicle, you should insist on a Flatbed Tow Truck. How long does it take a Towing Service located in Brighton-Le-Sands to reach you, on average? It depends on traffic conditions, whether there’s been an accident on the road you’re on. Also, how well located the Tow Service is. At Southside Towing, we make it a point to have Tow Trucks on standby in every suburb we service. If you live in Rockdale, Brighton-Le-Sands, Sutherland, Kogarah or any of Sydney’s Southern Suburbs, our convenient location means we will be able to get a Tow Truck to you faster than any of our competitors will be able to. We measure the speed with which we can get to you. On average, we get a Tow Truck to a customer in 31 minutes or less following a call from them to us for H.E.L.P. Sydney is a tough place to do business in – whether you’re big or small. In this city, what matters most is reputation. Which is why we are careful to take care of ours. We request feedback from all our clients after we serve them. You can review our service directly on our website or on our Facebook page. Therefore, we don’t remove reviews or ignore them. We simply fix them. Improving our service, and the way we deliver it, in the process. 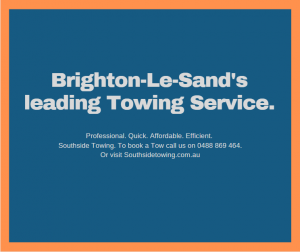 If a service-focused Towing Company in Brighton-Le-Sands is what you seek, then we are the company for you. Southside Towing is a Towing Service with more than 10 years towing cars, trucks, vans, utes, 4-wheel drives – prestige and value-based vehicles. If you’d like to get a FREE Quote to Tow your vehicle to a safe spot, please call us now on 0488 869 464. Alternately, fill in the Enquiry Form on the page.